Happy Friday and welcome to another #FocusFriday on #ThatBusinessShow where we work to help you #Focus on key areas within your business. This week’s focus was on the importance of involving an attorney in your contracts with guest Lisa Wilcox. She is the founder of Wilcox Law and an expert in contract law and international law too and her focus is on helping consumers for the last eight years through bad debt collections, foreclosure defense and faulty robo-dialing issues. She also incorporates advising businesses on how to prevent them from getting into consumer debt issues. “Every business needs a contract lawyer” states Lisa who advises that as a business you are not a consumer, you are a business and have less protection under the law. A great tip in the #MorningDiscussion is to ensure your contracts have a provision to avoid a Telephone Consumer Protection Act Lawsuit which deals with robo-dialing issues centered on advertising or collections. We hear about a recent lawsuit that affected Papa Johns in this area and it was the fault of their advertising agency too. For businesses that are large, be sure you are familiar with skip tracing and are accurately dialing numbers so as to not end up on the line with a person to whom the debtors number was transferred also. Lisa reminds us too that just because you are a new entity or a small company, that does not mean you cannot negotiate better terms in your contract and shares with us some examples of David vs Goliath in this segment. A large portion of the discussion centered on upcoming changes to labor laws and we began with a discussion on what is a 1099 contractor’s definition and what is a w-2 employees definition. The IRS estimates that 80% of workers classified as independent contractors are actually employees and the IRS has launched a massive new “misclassification initiative” that will target small business owners so it is imperative you have your agreements outlined in contracts and reviewed by an attorney such as Lisa to ensure compliance and avoid fines!! As part of this crackdown, the Department of Labor has hired 100 new auditors solely to investigate misclassifications and state investigators are turning up the heat on employers too. In closing, we touched on the question of the week which is up in the Facebook group, Focus Friday and asks – Does your business have a will? Get involved in the discussion here https://www.facebook.com/groups/FocusFridays/ and reach out to Lisa at 888-945-2695 or online at http://www.wilcoxlawpa.com! And a reminder Each Friday at 7am, we speak with Juliann Nichols, CEO of Focus on You Strategy and another guest about their challenges, successes and failures and how working with Juliann and utilizing her strategies helped get them over the humps in their business. Check out www.focusonyoustrategy.com and take advantage of one of her many CEO Exchanges to get a preview of how she can help Bring Out the CEO in You! The next CEO Exchange is being held October 4th from 11am to 1pm at the C1 Bank in Hyde Park and you can register by clicking here! Our 8am guest was Madison Miller, Cancer survivor and Founder of Spark the Way, a 501c3 that works to bring financial resources, and support to young victims battling Cancer. Madison was diagnosed with cancer when she was 20 years old and that same month, cancer also took her grandfather’s life. Not too soon after that her Grandmother was diagnosed with Cancer and still fighting to this day. In 2013, she was questioning God as to why she was afflicted so young and found solace in the Bible and his trustworthiness and her faith gave her the powerful ability not to fear cancer. She launched Spark the Way 2015 became an official 501(c)(3)!! In time, she hopes to accomplish a legacy that is about the people who Spark the Way impacts – the first generation of light-bearing, fearless fighters. Not in shining our own light, but in reflecting God’s. John 1:1-5. She is hosting her Ignite the Light Gala on November 5th from 6pm to 9pm to raise funds and grants and awareness for young adult cancer and you can register online at www.sparktheway.org/events Missed this inspirational story? Find it online here and learn more about Spark the Way at www.sparktheway.org! Our next guest was Dr. Ron Eccles, Speaker, Coach and Business Trainer. Dr. Ron is an accomplished entrepreneur having worked in many industries including Chiropractic, Real Estate Investments and Sales and was in studio today to talk about the 3 Principles in Business. These were noted as do not limit yourself by your own personal health – meaning the stronger your personal health, the stronger your business will. Second was a discussion on the Law of Sowing and Reaping and lastly a discussion of Spending vs. Investing. Check out this discussion here and take advantage of Ron’s offer for serious entrepreneurs only – a free consultation by calling him at 484-515-4040 and learn more at www.conquermyeverest.com! Are you a business owner in the Tampa Bay area? If you are, we invite you to apply for membership in Tampa Bay’s Premier Business Society, TBBO, the Tampa Bay Business Owners. You can apply via this link http://www.tbbo.org/member-application and the investment is just $595 for the year or $59/monthly (one-time $250 startup fee) and includes many benefits outlined here . Also as a promotion to prior radio show guests, if you join our business organization, you will be re-booked onto the program with the right to bring a guest of your choice to join alongside you. This is a great perk for an existing client or you can use it to get your foot in the door with someone you are trying to establish business with by offering them something of value. Many other benefits included on top of this so act today!! Welcome back to #MorningsWithMeloni on #ThatBusinessShow! After a long Labor Day weekend, its good to come back to the regular flow of things, so thank you for including #ThatBusinessShow with Jamie Meloni on #1250whnz at 8am every weekday into your morning routine. Today, the show took a bit of a more personal turn. We had on our first segment Tim Sweeney, J.D., CCJAP of Sweeney Interventions, an intervention company that dedicates itself to people who suffer from addiction, and what the correct path for the person is. Joining us for the second segment, we had Karen Mertes, an honorably retired United States Air Force Lieutenant Colonel with Fulfill Your Destiny. Fulfill Your Destiny is a charity dedicated to helping others in the Tampa Bay Area! Remember, #ThatBusinessShow is on #1250whnz every weekday, and on the show we have guests on who are impacting the Tampa Bay and surrounding community, and who are successful entrepreneurs, so if you’re interested in coming on the show, send me a message on http://www.tampabayradio.com! 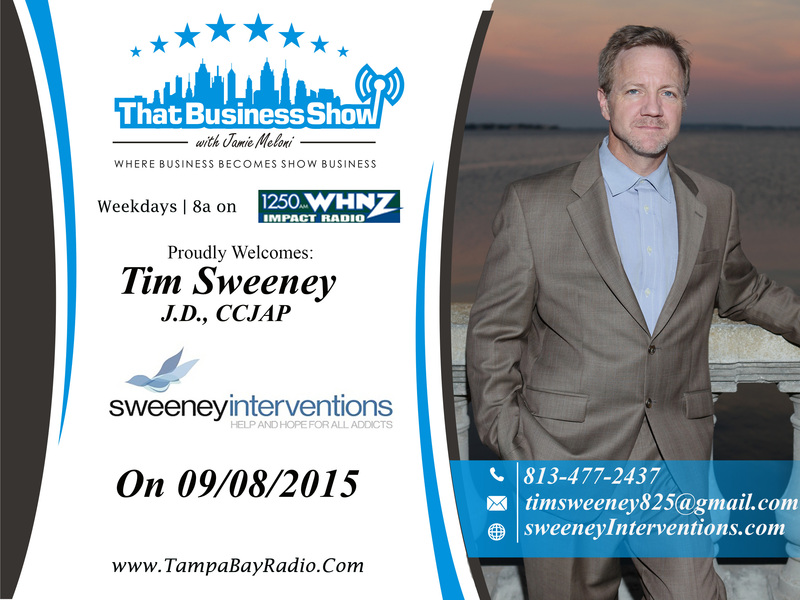 On the first segment, we had Tim Sweeney, J.D., CCJAP of Sweeney Interventions. Tim Sweeney is a Florida-licensed attorney and Certified Criminal Justice Addictions Professional. Sweeney Interventions helps families across the country intervene upon their loved ones to engage in recovery from addiction. Tim has performed over 200 successful interventions and 150 Marchman Act civil commitments. On the show, Tim discussed the nuances of his company,and how they are different from your typical intervention group or an AA meeting. Tim prides himself on getting real results, with a 98% success rate! Tim was telling us some pretty wild stories of people trying to escape their addiction help! Very interesting content on #ThatBusinessShow, and you can find out all about Tim Sweeney and Sweeney Interventions at http://www.sweeneyinterventions.com or email him at timsweeney825@gmail.com! 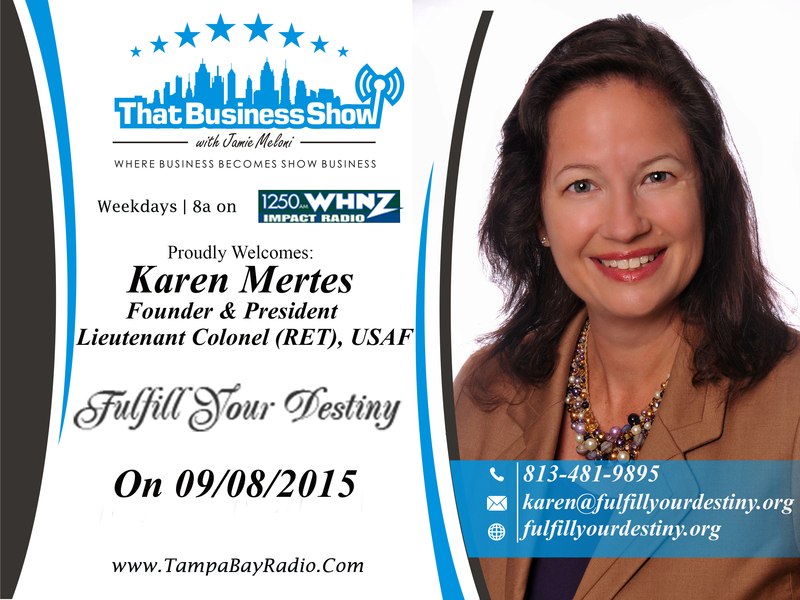 Joining us on #ThatBusinessShow was also Karen Mertes, an honorably retired United States Air Force Lieutenant Colonel with Fulfill Your Destiny. Karen has an amazing story. She suffered a massive car accident involving a drunk driver. Near death and with a massive brain injury, she vowed to help others if she survived, and that’s how Fulfill Your Destiny was created. Fulfill Your Destiny is dedicated to helping others in our community become successful, or helping them out in order to give them the tools to live a better and happier life. Whether its helping a young child with school or giving a foster child their own car, Fulfill Your Destiny does some real good for the Tampa Bay community. Karen discussed her new book with us, Plaintiff 101, coming out on Amazon next Tuesday! Karen and Jamie also discussed the process for people to go through if they suffer a tragic accident like she did. But all that valuable information is in her new book, Plaintiff 101. So check that out! You can also learn more about Karen and Fulfill Your Destiny at http://www.fulfillyourdestiny.org, or email her at karen@fulfillyourdestiny.org! As always, thank you for tuning into #ThatBusinessShow with Jamie Meloni on #1250whnz, weekdays at 8am. If you missed today’s show, you can always visit my website and see all of our shows on demand at http://www.tampabayradio.com or visit my YouTube channel at http://www.youtube.com/jamiemeloni.